Well, we have our “bit of earth”- about 3/4 of an acre of property, and about half of that is a sunken marshy area with a cattle pass leading onto it. There are no cattle there nowadays, but due to it being low ground we can’t build there anyway. So that leaves us with about 1/3 of an acre to build on, and we have to do some careful measuring and juggling to fit some key elements onto it. First- a well needs to be dug. We need to find out just how far from the road/property line it needs to be, according to code. 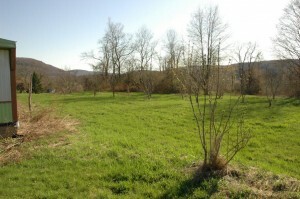 Second- a septic system needs to be put in. 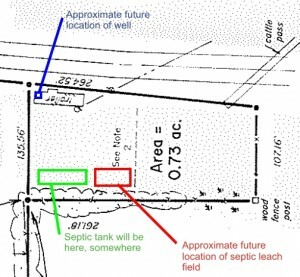 Per the building code, the septic tank needs to be at least 50 ft away from the well and the leach field needs to be at least 100 ft away, for pretty obvious reasons. Third- a house needs to go up! Lengthy discussions and sketches and “bring-a-tape-measure-outside-to-see-exactly-what-this-will-look-like” sessions have led us to the conclusion that this house will be “compact”- not tiny per se, but certainly not sprawling. This is actually just what I was hoping for, but my gosh did the outline look tiny (TINY) when we measured it out! The septic system is going to be on the lowest part of the property, and the well on the highest part, so there’s no possibility of septic runoff into our well area. So, looking at the diagram, you can see that there’s really only one way to set this up while adhering to the code. 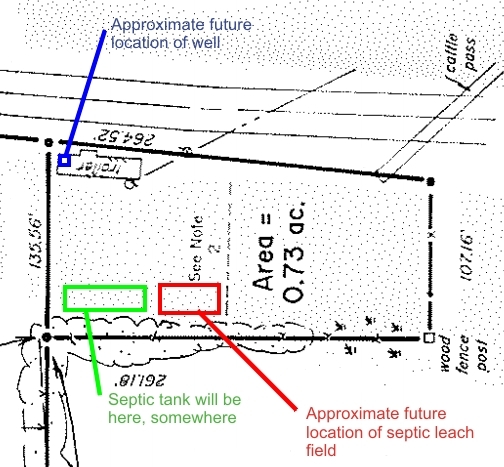 This entry was posted in Planning, Septic on April 29, 2013 by Grace. The wife. The whiner. The motivator. The ideas person.